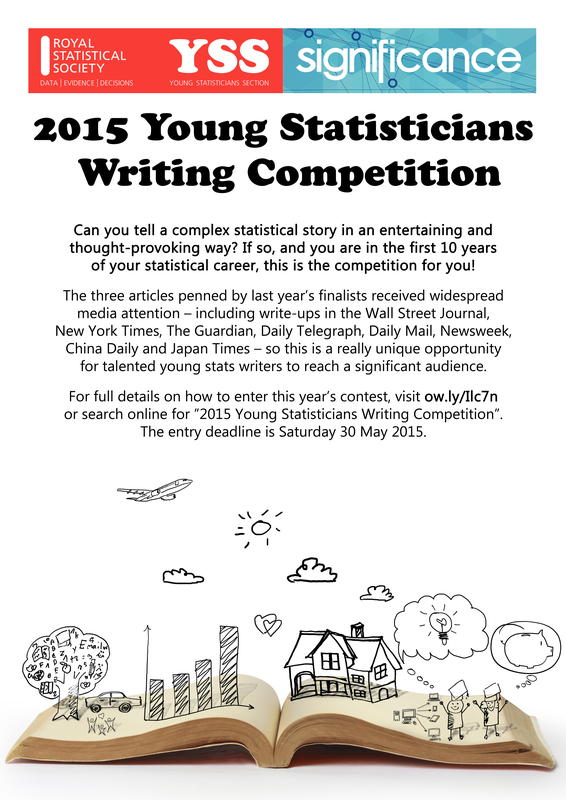 ANNOUNCEMENT – The 2015 Young Statisticians Writing Competition is now open! Can you tell a complex statistical story in an entertaining and thought-provoking way? If you think you’ve got what it takes, and are within the first 10 years of your statistical career, we want to hear from you. Each year, Significance and the Young Statisticians Section of the Royal Statistical Society host a competition to promote and encourage top-class writing about statistics. This year’s competition is underway. The rules of entry are simple. Send us your best article, of between 1,500 and 2,500 words, on the subject of your choosing. The article could be on work that you have done, or it could explain the work of others. The winning article will be published in the October 2015 edition of Significance and on significancemagazine.com. Runners-up will also be published online. Last year’s winner, Jonathan Auerbach, used public data and a variation on capture-recapture methodology to counter the myth that New York City is home to as many rats as people. Following publication of his prize-winning article, write-ups of his work appeared in the Wall Street Journal, the New York Times, the Daily Mail, Newsweek, China Daily and Japan Times. Of our two runners-up, Nathan Cunningham used Google search data to investigate the claim that Christmas comes earlier each year, while Katie Saunders compared survey data to medical records to check whether patient ethnicity is correctly recorded. Nathan’s analysis was widely reported in the UK and Ireland, including on the front page of the Daily Telegraph, while Katie’s research was covered by The Guardian. The article should be interesting, engaging and easy to read. Technical terms and mathematics should be kept to a minimum, and explained clearly where used. Readers finish the article knowing more about statistics than they did before. Three finalists will be invited to present their work at a special session of the Royal Statistical Society International Conference (7–10 September, Exeter, UK) and that is where the overall winner will be announced. Please email your submissions in a text/Word file or as a PDF, to ysswritingcompetition2015@gmail.com. Three finalists will win a one-day registration to the Royal Statistical Society Conference 2015 in Exeter, UK – but please note that travel and accommodation costs will not be covered.